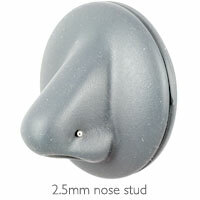 Hypoallergenic titanium nose/nostril studs with fixed 2mm or 2.5mm ball. Sometimes I need a plain stud and I really like it. It's a little thicker than my current nose stud, I haven't been able to wear it yet.. I ordered this as I think I was having a reaction to the steel stud I was given when pierced. It looks exactly the same and I liked it so much I bought the larger ball size, too! I've had my nose pierced for more than 20 years and have always adapted earrings myself. Having developed an allergy, I'm exploring the world of titanium and thought I'd give the 'proper' nose studs a go, but they're not for me - the post is far too thick and they're far too fiddly. I bought this because I'm allergic to silver and kept having infections around my nose piercing. Although it was difficult to get in it's been far more comfortable than any other studs I've tried. It's been in for about a month now and no problems or infections so far! The only reason I didn't give it 5 stars is it's not as silver-looking as the picture shows.